(UPDATE – SEE BELOW) ExoMars, the next departure for the Red Planet, is set to lift off from Baikonur on 14 March 2016, and the teams here at ESOC are in absolute high gear getting ready to go. The ExoMars flight director, Michel Denis, and the spacecraft operations manager, Peter Schmitz, who, despite being completely absorbed in launch and LEOP preparations, have kindly taken time to explain the mission operations concepts and activities behind ExoMars/TGO. Today’s Big Blog Post aims to provide as much of this information as possible, highlighting the most important aspects of the mission operations activities, centred primarily on the mission control team at ESOC (a somewhat different version appears in this web article). We’ve also cited the crucial involvement of the science operations team at ESAC and the industry support teams at TAS (I&F), who will oversee the entry, descent and landing of Schiaparelli. As always: the dates, times and sequence of events described below are subject to change. UPDATE 27 July: We’ve updated the section below detailing what happens on 28 July for DSM-1 – the first of two deep-space manoeuvres that will provide about 95% of the push needed to get Ex0Mars/TGO and Schiaparelli lined up to intersect Mars on 19 October. UPDATE 5 April: Following a totally smooth lift off and injection onto interplanetary trajectory on 14 March, we’ve updated this post with the newest information from the mission control team at ESOC. We’ll keep applying updates as ExoMars progresses through the cruise phase, at least for a few months, so that this post can serve as a ‘living’ document and handy, up-to-date reference. Note as always: all dates, times and activities mentioned herein are forecasts until they happen and are subject to change. Today, we’ve added notes and info related to the mid-course manoeuvre, arrival at Mars and Schiaparelli’s Entry, descent and landing. There are two missions in the ExoMars programme: one comprises the Trace Gas Orbiter (TGO) plus an Entry, Descent and Landing Demonstrator Module (EDM), dubbed Schiaparelli, launch in 2016, and the other, comprising a European rover and a Russian static lander, with a launch date of 2018. Both missions are in cooperation with Roscosmos. The 2016 ExoMars TGO carries scientific instruments to detect and study atmospheric trace gases, such as methane. EDM contains sensors to evaluate the lander’s performance as it descends, and additional sensors to study the environment at the landing site. After separation, command and control of ExoMars/TGO will be taken over by ESA’s mission control teams at ESOC, who will operate both TGO and the Schiaparelli Entry, Descent and Landing Demonstrator Module (EDM) throughout their missions . At ESOC, the ExoMars Flight Control Team are supported by experts from flight dynamics, ground stations and software systems to conduct full-time mission control. From European industry, the Flight Control Team are supported by experts from Thales Alenia France and Thales Alenia Italy (sometimes referred to as TAS-F and TAS-I) who developed TGO and Schiaparelli, respectively. Once Schiaparelli separates and subsequently lands, its mission will be automated, based on settings primarily developed by ESA’s TAS-I. On launch day – Contact between mission controllers and ExoMars/TGO is was maintained via the Italian space agency (ASI)’s 2m dish antenna at Malindi, Kenya, and by ESA’s 15m ground stations at Maspalomas, Spain, and Kourou, French Guiana. Flight dynamics experts at ESOC will perform the first ‘orbit determination’ for ExoMars/TGO after gathering radiometric data via Maspalomas station. Subsequently, as the craft embarks on its journey to Mars, tracking and telecommanding duties are handed over to ESA’s ‘Big Iron’ – the 35m-diameter deep-space tracking stations at Malargüe, Argentina, and New Norcia, Australia. These two stations in can provide 24 hr/day communication coverage. Both are part of ESA’s tracking station network – Estrack – a global system of ground stations operated from ESOC. As Mars presently orbits below the ecliptic plane, ground stations in the southern hemisphere are especially suited for establishing daily radio contact. Until 24 April – En route to Mars, the ExoMars/TGO spacecraft is now in the commissioning phase and mission control teams at ESOC and science operations teams at ESAC, ESA’s establishment near Madrid, Spain , check out, verify and test all systems and instruments. The Schiaparelli lander will similarly be checked out by industrial teams from Thales Alenia Space (Italy). Daily communication passes are provided by New Norcia station during daylight hours in Darmstadt, with additional support from Malargüe station as required. In early April, the NASA radio transponder will be switched on and tested by a joint ESA-NASA team to ensure its correct functioning, non-interference with the TGO imaging payload and the ability to work with ESA and NASA ground stations. This device will play a crucial role once TGO is in routine orbit at Mars, providing daily data relay services for NASA and ESA rovers on the Martian surface. Until end-June – ExoMars/TGO enters the cruise phase as it continues enroute to Mars; on-board activities are relatively quiet and ground station passes are only scheduled three times weekly. Mission control teams continue verifying and confirming the health and functionality of TGO and Schiaparelli in the harsh environment of interplanetary space. In parallel, the teams start to intensify preparations for the arrival phase, taking into account the experience from the first months in flight. Mid July – Until mid-August: Teams at ESOC will conduct a series of ultra-precise navigation measurements known as ‘delta-DOR’, for ‘Delta-differential One-Way Ranging‘. This advanced technique uses signals received from quasars (quasi-stellar radio sources) to correct the radio signals received from ExoMars/TGO, resulting in an extremely precise position determination. How precise? The spacecraft’s position in space can be fixed on the order of just several hundred metres at a distance of 100 000 000 km. Results will be used to calculate the upcoming mid-course correction manoeuvre (also called the ‘deep-space manoeuvre’). A second Delta-DOR campaign in September-October will generate results that will help determine the Mars orbit injection for TGO and the final Schiaparelli descent trajectory. 28 July – TGO carries out one of the most critical activities during the voyage to Mars: a very large engine burn in deep space (DSM-1) that starts at 12:00 09:30 UTC (11:30 CEST), runs for about half an hour 50 mins and will change the craft’s direction and speed (‘delta-v’) by 326.497 m/second (the amount of delta-v is programmed; the length of the burn will be automatically controlled by on-board software, which will shut off the engine once the target delta-v is achieved, as sensed by accelerometers – this should be about 50 mins). The mission operations team will spend ten days starting on 18 July to prepare for this critical burn, starting with a brief test of the spacecraft’s main engine on 18 July (Update: 27 Jul: This test was repeated, satisfactorily, on 21 July, after the first one gave unsatisfactory results). Until 19 October – The work of the mission control teams is becoming steadily more intense, and ESA’s Estrack ground stations are now providing daily telecommanding passes. From five days before arrival until five days after, New Norcia and Malargüe ground stations will provide 24 hrs/day radio contact as engineers at ESOC carefully monitor the spacecraft and conduct its complex orbit-entry activities. The final commands for the Schiaparelli EDM will be prepared and uploaded, and all systems on both TGO and Schiaparelli will be thoroughly checked out in the run up to arrival. During the critical arrival period, the ExoMars mission control team will work from the Main Control Room at ESOC 24 hrs/day, starting no later than 14 October. Schiaparelli will have been warmed up by a dedicated Sun orientation providing a ‘thermal boost’ for the 10 days prior to separation, in view of economising electrical energy for heating after separation. In the last day, it will be switched on, and its systems checked out one final time. Experts from TAS (I) working at ESOC will prepare the final set of time-tagged commands, which will be uploaded via TGO and stored on board Schiaparelli so that it can function more or less autonomously throughout its mission. TGO will eject Schiaparelli at 14:42 UTC, dispatching it on a three-day coast and a six-minute descent to the surface. This action will be executed by the time-tagged commands uploaded in advance. Prior to separation, TGO will perform a ‘slew’, rotating about its axes to a specific orientation in space such that only its low-gain antenna will face Earth. As a result, ESA will enlist the support of NASA’s giant 70m Deep Space Network (DSN) ground stations at Canberra, Australia, and Madrid, Spain, to listen for the spacecraft’s signals as the Schiaparelli EDM module separates. It will be pushed away from TGO at just 30 cm/second, but this tiny push can be detected by the DSN stations. 17 October 2016 – 12 hours after Schiaparelli has separated, at 02:42 UTC, the ExoMars/TGO orbiter will conduct an ‘orbit raising manoeuvre’ – a modest (10 m/sec; it runs just a few minutes) but crucial engine burn that must provide a change in direction, raising its trajectory to several hundred kilometres above the planet. Time-tagged commands for this burn will be uploaded in advance and stored on board for automatic execution. If this burn is not conducted, TGO would, like Schiaparelli, hit the surface on 19 October, which would mean loss of the craft. This manoeuvre will line the craft up for the critical burn on 19 October around the closest distance to the planet, which will slow it sufficiently to be captured by Mars’ gravity; this will be the so-called ‘Mars Orbit Injection’ (MOI). If for any reason Schiaparelli fails to separate from TGO on 16 October, a back-up separation slot will be triggered automatically 32 hours later on 17 October. For separation on 16 or 17 October, it is expected that Schiaparelli could conduct its nominal EDL mission. Should that second attempt to separate be unsuccessful, an emergency ejection will automatically follow; if separation occurs only on that third attempt, a nominal Schiaparelli mission would not be possible1. During the critical arrival activities, several of NASA’s 34m deep-space stations will provide a ‘hot back-up’ to ESA’s Estrack stations, ensuring that there is no loss of communication at a time when any delay in commanding could have a serious effect on orbit entry or landing, in particular if it becomes necessary to recover or deviate from the nominally pre-loaded commands. If separation happens as nominally planned on 16 October and the orbit raising burn on 17 October go as planned, not much happens on 17 and 18 October; mission control teams at ESOC will maintain a very close watch on the craft. 19 October – Arrival Day for TGO/Landing Day for Schiaparelli! Note that the one-way signal time on 19 October will be about 10 minutes (9 mins:46 secs to be precise); keep this in mind when reviewing any discussion of how soon we on Earth will be able to get news of what’s happening at Mars. Continuing on its post-separation ballistic orbit, the 600-kg Schiaparelli will wake up 75 minutes prior to entering the Martian atmosphere, expected at 14:42 UTC, at an altitude of 122.5 km and a speed of approximately 21 000 km/hour. This will allow to prepare itself for the start of the intense six-minute atmospheric phase. An aerodynamic heatshield will protect Schiaparelli from the severe heat flux and deceleration, so that at an altitude of about 11 km, when the 12 m- diameter parachute is deployed, it will be travelling at around 1650 km/hour. Descending under its parachute, Schiaparelli will release its front heatshield at an altitude of about 7 km and turn on its Doppler radar altimeter, which can measure the distance to the ground and its velocity relative to the surface. This information is used to activate and command the propulsion system once the rear heatshield and parachute have been jettisoned 1.3 km above the surface. Between 1300 m and 2 m altitude, the propulsion system will slow it from 270 km/hour to just 7 km/hour; at that height, the engines will be switched off and Schiaparelli will free-fall to the ground, where the final impact, at just under 11 km per hour, will be cushioned by a crushable structure on the base of the lander. Schiaparelli will target a landing site on the plain known as Meridiani Planum. This area interests scientists because it contains an ancient layer of hematite, an iron oxide that, on Earth, almost always forms in an environment containing liquid water. Once on the surface and operating as planned, combining the relay capability of NASA’s Mars Reconnaissance Orbiter (MRO), Odyssey and MAVEN spacecraft together with ESA’s Mars Express, there will be an orbiter pass at least every 12 hours (when the lander can transmit is science data), providing over 20 passes in total during the up-to-eight days of its surface operation, should the lander battery survive that long (more details on the Schiaparelli surface science mission). During the critical Schiaparelli EDL phase, there will be four sets of ‘ears’ listening for signals transmitted from the lander: ESA’s TGO and Mars Express orbiters, NASA’s Mars Reconnaissance Orbiter and – back here on Earth – the Giant Metrewave Radio Telescope near Pune, India. ExoMars/TGO will use its radio system to record signals from Schiaparelli during its descent to the surface, similar to what Mars Express and MRO will do. This information will be stored on board and later transmitted to Earth, where it will be processed at ESOC to extract telemetry and other information to enable a detailed reconstruction of the descent profile and the functioning of the module under the extreme conditions of atmospheric entry. Due to the time necessary to download this large volume of data, and the time necessary to analyse it at ESOC, it will not be available until a number of hours after EDL. Note that the information recorded by ExoMars/TGO is expected to provide the best reconstruction of Schiaparelli’s EDL profile and behaviour and will include detailed telemetry (TM), i.e. information on the status of systems and instruments on board the lander during EDL. During Schiaparelli’s critical EDL phase on 19 October, ESA’s Mars Express probe, which has been orbiting the Red Planet since 2003, will monitor and record signals from the module. This so-called ‘open-loop’ recording using MEX’s Melacom communication system will enable Mars Express to detect critical events such as parachute deployment, heatshield jettisoning, touch down and start of operations on the surface, which will be relayed immediately thereafter to mission controllers at ESOC. The amount of Schiaparelli signal data recorded by Mars Express will be kept small, so that the recorded information can be quickly relayed to Earth. Receipt of this recording, about 60 minutes after actual descent, and allowing approximately 60 mins for the data to be processed at ESOC, will provide the first in-situ confirmation from Mars of Schiaparelli’s arrival and landing, at about 17:00 UTC (note that the first confirmation on Earth will come from the GMRT recordings – see below). Upon landing, Schiaparelli will commence surface science operations, lasting until approximately 23 October. In addition to Mars Express, NASA’s Mars Reconnaissance Orbiter will also record signals from the module. Details of the MRO overflight are still being worked out (as of early April). Due to the geometry between the MRO orbit and the landing site, signals will only be received after Schiaparelli has touched down. This has been designed to distribute the relay tasks between the various orbiters during and just after EDL. MRO has a high performance communications system; so, while recording will happen only after EDL, transmission to Earth of the first post-landing EDM data set will happen quite quickly. It is expected that MRO will have visibility and should be able to record and transmit Schiaparelli signals from the surface for a period of about 10 minutes during the time period running between 30-90 minutes after landing. For this to happen, Schiaparelli must wake itself up to transmit at the correct time, as it is programmed to turn off its radio system to preserve battery power when no orbiter is in sight. MRO will be capable of recording the telemetry sent from the surface from Schiaparelli via the so-called ‘Proximity protocol’. This telemetry, however, must be processed upon arrival at ESOC, so this data is not expected to be in hand with the ExoMars mission control team until a couple of hours after landing. This vital support is just one further example of the deepening cooperation at Mars between ESA and NASA. In 2008, Mars Express recorded signals during the entry, descent and landing of NASA’s Phoenix lander; in 2012 MEX images helped refine NASA’s Mars Science Laboratory (MSL) landing ellipse and it recorded signals from MSL during descent. Mars Express has also routinely tested the relaying of data from NASA rovers on the surface to ensure it can provide back-up contact if needed. Schiaparelli’s descent is also expected to be recorded on Earth by scientists using the Giant Metrewave Radio Telescope (GMRT), located near Pune in India. GMRT comprises an array of 30 radio telescopes (each with a dish diameter of 45 m ) operated by the National Centre for Radio Astrophysics, a part of the Tata Institute of Fundamental Research, Mumbai, and it is one of the world’s largest interferometric arrays. To enable recording of Schiaparelli’s signal across the 175 million kms between Earth and Mars on 19 October, the GMRT will be augmented with radio science equipment developed at NASA’s Jet Propulsion Laboratory (JPL), which was designed to record the entry and descent of NASA’s InSight Mars lander as well as ExoMars/Schiaparelli. InSight’s original March 2016 launch is now delayed, and so the equipment will now first record Schiaparelli’s descent . 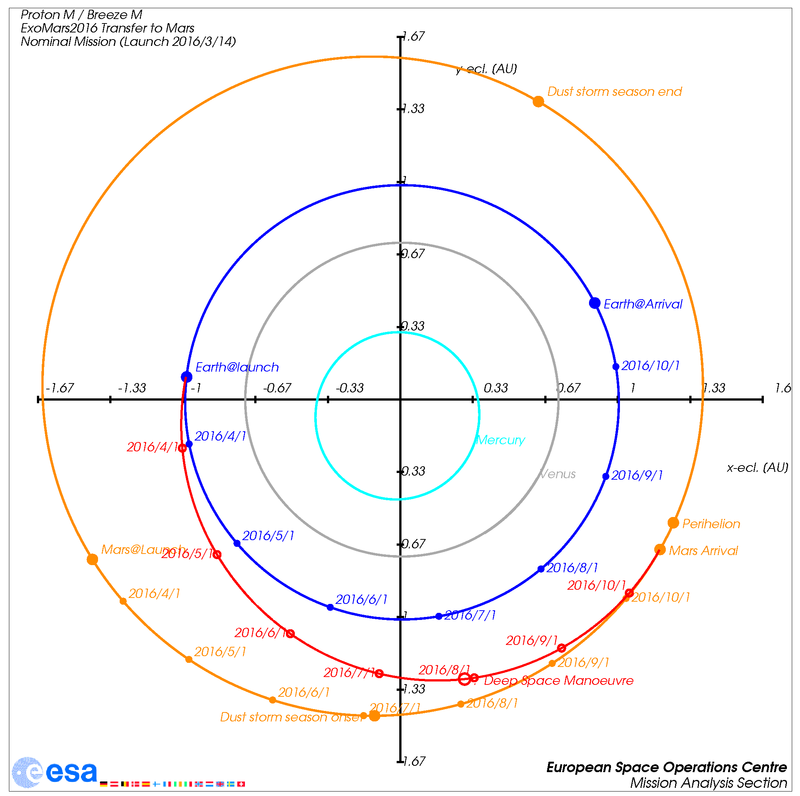 A joint JPL/GMRT team will record the descent signals, and make the recorded plot immediately available to mission controllers at ESOC, providing first confirmation of Schiaparelli’s arrival. This implies confirmation at ESOC around 14:58 UTC, possibly a few seconds later. If it can be seen and confirmed that the radio signal received via Pune continues past 15:00 UTC, this will be a good indication that the landing of Schiaparelli has gone well and that the craft is now working nominally on the surface of Mars2. Conversely, any loss or interruption in the signal does not necessarily indicate or confirm a problem with the lander, as the break in receipt could be caused by a problem within the Pune hardware or software. It must be noted that the detection of the Schiaparelli UHF radio signal by the Earth-based radio-telescopes at such large distance is of an experimental nature and cannot be guaranteed; indeed its landing site on Mars is facing the Earth, but the geometry of the EDM descent is not particularly favourable and the situation is complicated by the lander spinning for stability. A few minutes after 15:00 UTC (15 minutes after landing), Schiaparelli is programmed to go into hibernation (to conserve its battery power), and to wake up later when the next data relay pass with NASA’s MRO begins. GMRT Pune – Radio telescope array will receive Schiaparelli signal in real time; atmospheric entry, descent, landing and start of operations on the surface can be confirmed at ESOC starting at 13:37 through to 15:00 UTC. Mars Express – Orbiter will record open-loop radio signals, then slew, point to Earth and transmit to ESOC, with the download arriving about 16:00 UTC. The information received must be analysed on ground, so can be delivered to ExoMars/TGO Flight Director at about 16:30 UTC. ExoMars/TGO – Orbiter will record full and detailed radio signal and telemetry data, store same on board and then download after the end of its Mars Orbit Insertion and reconfiguration. This large dataset is expected to be fully transmitted to ESOC and processed about 10 hrs (TBC) after EDL, so will be available on 20 October at about 01:00 UTC. NASA MRO – Orbiter will record telemetry data from the first on-surface transmission by Schiaparelli after landing, store same on board and download later. These data are expected to arrive at ESOC about 70-100 mins after EDL, so at about 16:45 UTC. It will be directly fed in the mission control systems and show the status of Schiaparelli post-landing as well as a preliminary subset of the descent and landing information. What if signals from the lander are lost? If the signal from Schiaparelli is lost at any point, mission control teams will not be able to conclusively understand what happened until the (highly detailed) recording from TGO is received, i.e. until after 01:00UTC on 20 October. After landing, the communications between Schiaparelli and MRO is not established for some reason – this is the very first pass on surface, out of many. TGO does record the full detailed dataset, but, as described above, this is only received and analysed on ground after 03:00 UTC on 20 Oct. So, although none of points b,c or d above should happen, they could happen and it is very possible that confirmation of nominal Schiaparelli EDL comes on the following morning, 20 October, even if nothing is received or confirmed on 19 October. On 19 October, the TGO orbiter will carry out two critical activities, virtually at the same time. First, as described above, it will use its radio system to record signals from Schiaparelli during its descent to the surface, similar to Mars Express and MRO. Second, it will conduct a critical engine burn, using its 424-N main engine to conduct the Mars Orbit Insertion (MOI) manoeuvre. This manoeuvre will slow TGO by 1550 m/sec, sufficient to be captured into an initial Mars orbit (this delta-v – change in velocity – is double what was needed for Mars Express capture in 2003), and will last about 134 minutes, beginning at 13:09 UTC on 19 October (we think the hashtag will be #BigBurn – Ed.). This absolutely critical manoeuvre will be tracked by ESA 35m and NASA 70m ground stations, which will provide a live feed of progress to mission controllers at ESOC. The stations will conduct tracking of the X-Band signal transmitted by the TGO’s omnidirectional low-gain antenna, so controllers will see the craft’s change in speed as it happens in real time (well, ten minutes later on Earth). Successful completion of the burn, expected at 15:23 UTC, will mark the second time Europe has placed a spacecraft into orbit around the Red Planet. Confirmation by TGO itself of burn completion should be seen on ground within one hour of the burn completion, so about 16:30 UTC. The initial highly eccentric orbit is dubbed the ‘4 Sol’ orbit, as it will take TGO four Martian days to complete one revolution, with its altitude above Mars varying between 298 km and 95 856 km. Successful capture by Mars means that TGO can begin a lengthy series of orbital adjustments. 11 January 2017 – TGO orbital inclination will be adjusted to 74°, which is optimised for its science and radio relay missions. On 17 January 2017 , it will perform an Apoares-reduction manoeuvre to go from the initial 4-Sol orbit to a 1-Sol orbit. January – November 2017 – TGO will employ sophisticated aerobraking techniques – the first time ESA will do so to attain a science orbit around another body in our Solar System – to steadily lower itself to a circular, 400-km orbit. With aerobraking, the TGO solar arrays will be used to generate tiny amounts of drag due to the wisps of Martian atmosphere at very high altitudes, which will slow the craft and lower its orbit. While aerobraking takes time, it uses very little fuel and will itself provide scientific insight into the dynamics of Mars’ atmosphere. 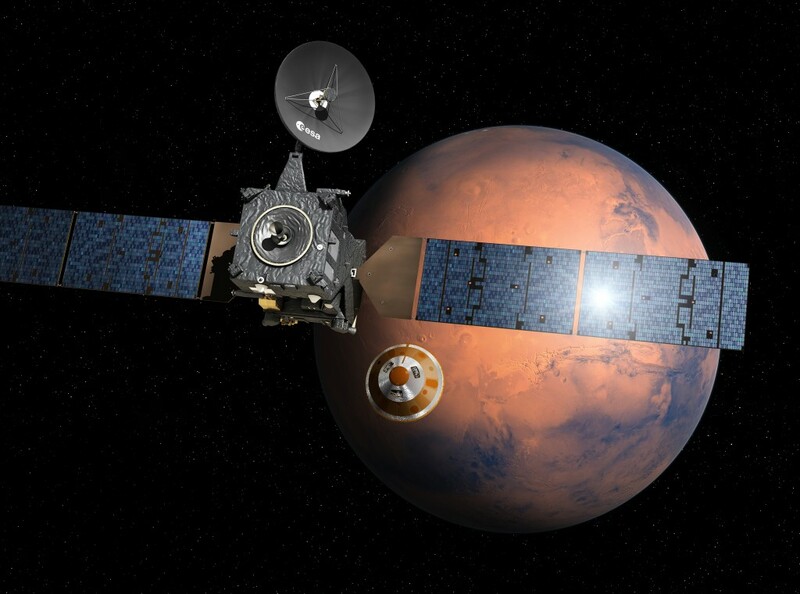 With ExoMars 2016, it will be the first time ESA uses aerobraking for an extended period of time to attain a science orbit around another body in our Solar System. TGO features a sophisticated radio relay capability provided by NASA. The Electra system, more formally called the ‘Electra Proximity Payload’, is a telecommunications package that acts as a communications relay and navigation aid. It comprises twin ultra-high frequency (UHF) radios and will provide communication links between Earth and craft on the Martian surface – rovers or landers. The relay of information from Mars surface craft to Mars orbiters, then from Mars orbit to Earth, enables receiving much more data from the surface missions than would otherwise be possible. TGO will provide daily data relay services to NASA’s Curiosity and MER-B (Opportunity) rovers currently on the surface, as well as to the InSight lander and ESA’s ExoMars rover. It will also support Russia’s lander and future NASA rovers. Flying NASA’s Electra payload with its advanced data relay capabilities on board ESA’s TGO orbiter marks a significant deepening of cross-agency cooperation and mutual support at Mars. Note1: If the Schiaparelli EDM module fails to function, or fails to separate as nominally planned, it can be discarded by the TGO orbiter on 17 October, whose mass would then be reduced sufficiently to conduct its planned orbit entry on 19 October. If for any reason Schiaparelli does not separate at all, and remains attached to TGO, the orbiter’s mass would not be sufficiently reduced (Schiaparelli has a mass of 600 kg) and the orbiter’s engine and available fuel would be unable to provide sufficient thrust to slow the combined mass of TGO-plus-Schiaparelli so as to be captured into Mars orbit on 19 October. In this case, the pair would instead be commanded to perform a flyby and escape into a heliocentric orbit that would bring them back to Mars in one or two years’ time. Then, there would be ways to approach Mars and conduct the burn necessary to slow the duo sufficiently so that they could be captured by Martian gravity, enabling TGO to carry out a still-useful science mission regardless of the lander. Note2: This is based on the logic that, if Schiaparelli lands nominally, then its signals will continue after the expected touch-down time. If signals end abruptly, this would be an indication that the lander is not functioning on the surface as expected.